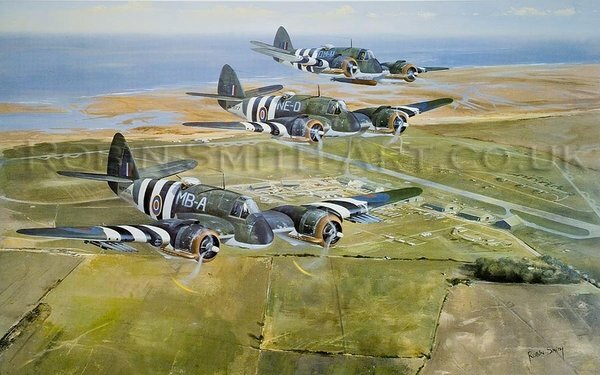 image size 20" x 12½"
This print depicts the three squadrons that comprised the first, and most successful coastal command strike wing, based at RAF North Coates, Lincolnshire. Using Beaufighters nicknamed "whispering death" due to their speed, armourment and low noise they worked together as a team, destroying enemy shipping with terrifying efficiency. A Beaufighter from 143 squadron would go in first using 20mm nose canon and wing guns. Secondly a Beau. from 236 squadron would follow with eight 60lb or 25lb rockets (25lb warheads were found to be more effective as they penetrated deeper into the hull, creating more damage). These two initial attacks reduced the on-deck anti aircraft initiative (heads down!). You've only got to look at some of the spectacular photos of convoys under attack, the ships can hardly be seen for water spray and explosions. This mayhem allowed a 254 Beau. with its 21" torpedo to finish the job off. The three squadrons operated together on three occasions during the war at North Coates: October 1942 - August 1944 / February 1944 / May1944 / September 1944 - October 1944. My print represents a Beaufighter from each squadron flying in formation over North Coates airfield, and was commissioned for a reunion of association members at the airfield on May 18th-20th 2001. The painting itself offered up quite a challenge for me as I had to figure out how to show a view of the airfield at the required height. This was solved by obtaining a period archive photo looking vertically down on the airfield, laying it flat on a table and subsequently photographing it at the required angle. This gave me all the required perspective. I had great pleasure, and was very honoured during the reunion, to have my prints signed by some of the members of the Strike Wing.